CHICAGO (WLS) -- Malik Bryant, a 13-year-old boy from Chicago's Englewood neighborhood who wrote a letter to Santa Claus asking for safety, has been invited to attend President Obama's State of the Union address. He was invited to sit in First Lady Michelle Obama's box Tuesday night. 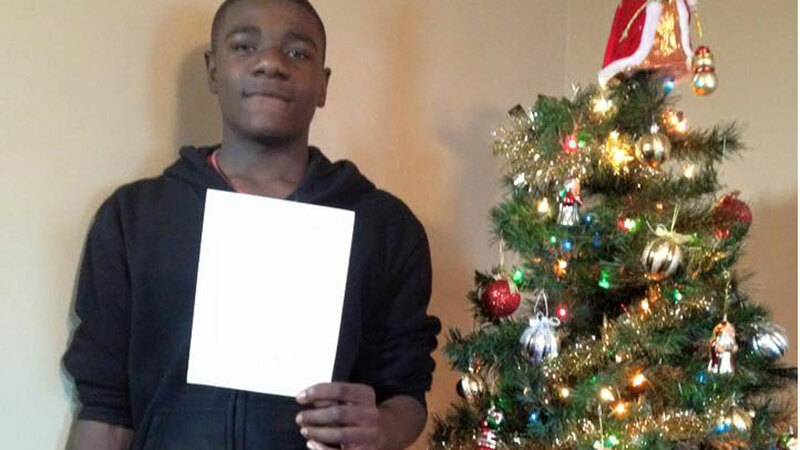 "All I ask for is safety," Bryant wrote in his letter over the holidays. "I just wanna be safe." The seventh grader was one of about 8,500 Chicago Public Schools students who wrote letters to Santa through a program run by Direct-Effect Charities. Someone in the nonprofit organization who was touched by Bryant's letter forwarded it to the White House. President Obama responded. "Each day I strive to ensure communities like yours are safe places to dream, discover, and grow. Please know your security is a priority for me in everything I do as President," Obama wrote in a reply. "If you dare to be bold and creative, work hard every day, and care for others, I'm confident you can achieve anything you imagine." A Maryland man who returned home last month after spending five years imprisoned in Cuba will have a prime viewing spot for President Barack Obama's State of the Union address: a seat near first lady Michelle Obama. Alan Gross and his wife, Judy, are among 22 special guests the White House invited to Tuesday night's speech. It's become tradition for presidents to invite people whose stories of tragedy or triumph highlight an issue or public policy. President Ronald Reagan was the first to do so in 1982 and acknowledge the guests, who sit with the first lady, during the speech. Every president since has continued the tradition. The year's group includes astronaut Scott Kelly, the president and CEO of CVS Health and eight people who wrote letters to Obama, including four he spent time with last year. Gross is a former federal subcontractor who was arrested in Cuba in 2009. His wife and others said he was there to set up Internet access for the small Jewish community on the communist island. He was released last month as part of a historic announcement by Obama that the U.S. would restore diplomatic relations with Cuba after five decades. Kelly, of Houston, is preparing to blast off in March on a yearlong space mission, longer than any other U.S. astronaut. His identical twin, retired astronaut Mark Kelly, is married to former Rep. Gabrielle Giffords, D-Ariz. She was gravely wounded four years ago during a shooting at a political event she held in Tucson. Six people were killed and 13 were injured. Scientists will compare medical data from the brothers to understand how the human body responds to longer durations in space. CVS Health pulled cigarettes, cigars and other tobacco products from its store shelves last year, a move that was applauded by Obama, a former smoker often seen chewing nicotine gum. The decision by CVS Health earned Larry Merlo, the drugstore chain's top executive, a seat in the first lady's box. - Malik Bryant, of Chicago. The 13-year-old wrote a letter to Santa over the holidays asking for safety. Instead of forwarding the letter to the North Pole, a nonprofit organization redirected it to the White House. Obama wrote back to say that security was a priority for him, too. - Chelsey Davis, of Knoxville, Tennessee. Davis is scheduled to graduate in May from Pellissippi State Community College with a bachelor's degree in nutritional science. She met Obama when he visited her school this month to announce a plan to make two years of community college free for students who keep their grades up. - LeDaya Epps, of Compton, California. The mother of three completed a union apprenticeship in construction, one of only two women to do so, and is on the crew building the Crenshaw/LAX light rail line. Obama has promoted apprenticeships as a way for people to get training for skilled jobs. - Rebekah Erler, of Minneapolis. The wife and mother of two young boys wrote to Obama about how her family suffered after her husband's construction business folded. Both are working again and recently bought their first home. Obama spent a day with Erler in Minnesota last year. - Victor Fugate, of Kansas City. Fugate wrote to Obama to share how he went from being an unemployed new father to getting his degree and helping low-income patients obtain medical care. Fugate says he and his wife are benefiting from an Obama program that caps monthly student loan payments. Obama met Fugate in Kansas City in July. - Retired Army Staff Sgt. Jason Gibson, of Westerville, Ohio. Gibson wrote to Obama to thank the president for visiting him as he recovered from injuries, including the loss of both legs. Gibson surfs, skis, has completed marathons on a hand cycle and earned a pilot's license. He welcomed his first child in November. - Nicole Hernandez Hammer, of southeast Florida. Hammer is a sea-level researcher who studies how cities and other areas most vulnerable to the effects of climate change also have large Hispanic populations. She works to raise Latinos' awareness of climate change. Addressing climate change is an Obama priority. - Anthony Mendez, of New York City. The University of Hartford freshman once had to rise at 4:30 a.m. to get to school after his family was evicted and forced to live in a homeless shelter. Mendez was among students who met Mrs. Obama last year. She spearheads an initiative encouraging students to pursue education after high school. - Katrice Mubiru, of Woodland Heights, California. Mubiru, a career-technical education teacher in Los Angeles, encouraged Obama in a letter to support K-12 adult and career technical education. She met and introduced Obama in July when he visited Los Angeles Trade-Technical College to highlight technical skills programs. - Astrid Muhammad, of Charlotte, North Carolina. Muhammad, a wife and mother of two, wrote to thank Obama for signing the Affordable Care Act. Last year, she obtained coverage under the law and had surgery to remove a potentially fatal brain tumor that was diagnosed in May 2013, when she had no health insurance. - Kathy Pham, of Washington, D.C. Pham is a government computer scientist who works to improve health information technology, expand access to benefits for veterans and improve the way government provides services to families like hers. Her mother received cancer treatment under the new health care law and her brother earned a Purple Heart for service in Afghanistan. -Capt. Phillip C. Tingirides, of Irvine, California. A husband and father of six, the veteran Los Angeles police officer heads the Community Safety Partnership program in the neighborhood of Watts, once scarred by race riots and subsequent gang violence. Under the program, begun in 2011, police engage with residents. - Catherine Pugh, of Baltimore. Pugh is majority leader of the Maryland Senate who helped pass legislation increasing the state minimum wage to $10.10. She has also introduced legislation to provide the state's workers with earned paid sick leave. Both are issues Obama is pushing at the federal level. - Carolyn Reed, of Denver. Reed described in a letter to Obama how she expanded her submarine sandwich shop business with a loan from the Small Business Administration. Obama dined last year with Reed and other Coloradans who wrote to him. Reed also told the president she was raising her hourly employees' wages to $10.10. - Dr. Pranav Shetty, of Washington, D.C. Shetty is the global emergency health coordinator for International Medical Corps, a partner in the U.S.-backed effort to control the Ebola outbreak in West Africa. Shetty went to Liberia in August, returned to the U.S. late last month and is going back to West Africa later this week. - Prophet Walker, Carson, California. While serving time for robbery, Walker started a prison program to help fellow inmates complete a two-year degree. After prison, Walker became a construction engineer and has worked to improve relations among law enforcement, community activists, parents and the children of local housing projects. -Tiairris Woodward, of Warren, Michigan. Woodward started a second job working on Chrysler's assembly line in 2010 to help support herself and three children, including one with special needs. She eventually began working only for Chrysler and after a year saved enough money to buy a car and rent a new apartment. The company's tuition assistance program is aiding her pursuit of a bachelor's degree in business management. The White House says her story is possible due to the comeback of Detroit and the U.S. auto industry. -Ana Zamora, of Dallas. A student at Northwood University, Zamora was brought to the U.S. illegally as a child and has benefited under Obama's program to defer deportations for eligible immigrants. Zamora wrote to Obama about her experience and says her parents will also be eligible for protection under Obama's recent executive actions on immigration.